Parents know their kids grow out of clothes and shoes, but do you realize they may also grow out of their closets? I’m not talking literally as much as I am figuratively; just as your kids’ taste and style change as they grow, so should their closet. Since today is the first day of spring, it’s the perfect time to help your kids go through their closets, getting rid of winter clothes and re-checking sizes of their spring and summer clothes…because let’s face it, what they wore last year may not fit anymore. Let me reiterate – you don’t need to bust down walls to make this happen. Instead, let’s think creatively of the needs of our kids at their different ages and stages of life. Once your kids are school age (say 5-6), they need to start learning to get ready by themselves. In order to make this possible, all their clothes need to be at eye-level. Another trick is to separate their clothes by event (church clothes, play clothes, school clothes). Keep in mind, some things in the closet may need to come out and find a new home in order to make this closet organization happen (consider under the bed storage or a hanging rack that can be used for shoes, clothes or toys). For items staying in the closet, choose bins that kids can easily use and even help label with what will be contained in there (toys, socks, dolls, etc.). As kids get older, they want the space to feel like their own. The overall goal is to develop routines for the future. So while there may be labels for younger kids, those labels can eventually disappear, even though the same storage and rituals exist. 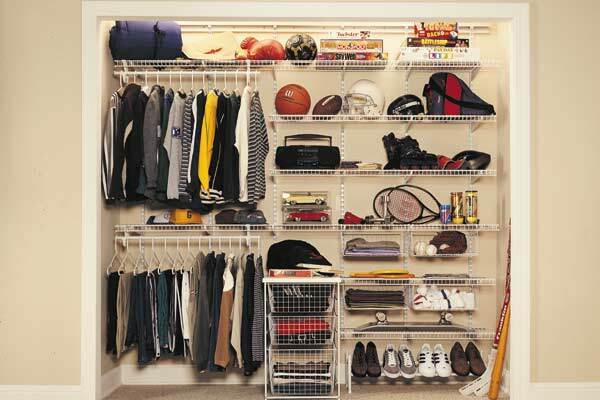 As you can see, while the space of the closet may not change, how you organize it can be adapted as your kids get older. If you’re looking to get a little spring cleaning done over spring break, today is the perfect day to stock up on essentials you love and know you’ll need more of, like Joy Mangano’s Huggable Hangers, since the VIP sale has been extended! Just use code VIP to save an extra 30% off at Macys.com through Tuesday.